The value of a new A320ceo (low gross weight, non sharklet, no SpaceFlex) at less than $42 million is virtually the same as 20 years ago. When entering service in 1988 the value of a new A320 approximated just over $30 million. The value of a new A320 increased rapidly in the following years as the production accelerated and as inflationary pressures escalated. The production rates in the late 1980s and 1990s precluded made it difficult to achieve economies of scale, thereby preventing pricing flexibility. The value of a new A320 continued to increase in the 1990s such that by the end of the decade the value had risen to above $40 million representing nearly a 30 percent increase although this was still lower than the general rate of inflation. With the events of 2001 the value of a new A320 tumbled to $37 million not least because lease rentals suffered. With lessors receiving new aircraft, lease rentals on new aircraft had to be attractive to compete with used aircraft that were repossessed or coming unexpectedly off lease. Boeing cut production but Airbus kept rates approximately the same. 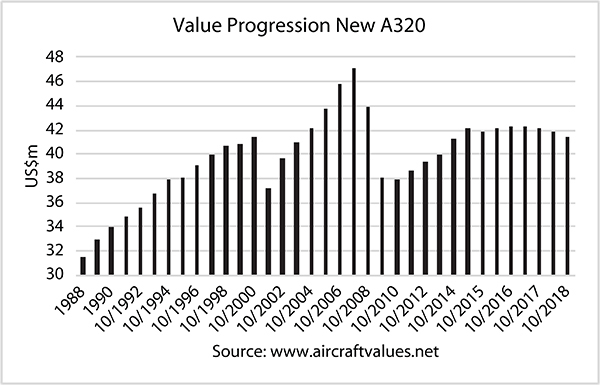 Thereafter, with the recovery of the market, values of new A320s started to improve, accelerating to a peak of $47 million as of 2008. Values fell markedly in 2009 and 2010 to less than $40 million as lease rates failed to improve and availability became a major issue. A period of readjustment followed but new values managed to increase even in the face of the development of the A320neo. Since 2013, however, values have failed to advance and more recently have fallen which is not unexpected due to the transition to the A320neo.